David Zurutuza is still missing due to injury for the home side, which should see Igor Zubeldia feature in central midfield. Alvaro Odriozola missed out on Real Sociedad’s Europa League game on Thursday with a knee problem, but might recover for Monday’s game. Juanmi should be fit after an injury scare this week, with Willian Jose to continue up top after netting four versus Vardar. Espanyol have no new injury problems heading into this La Liga matchday, with changes expected to be kept to a minimum. Marc Navarro should retain his place at right back, rather than Victor Sanchez coming back into the side. Leo Baptistao should be continued to ask to work back defensively on the right flank to free Jurado to roam centrally. There have been over 2.5 goals scored in Real Sociedad‘s last 6 home games (La Liga). 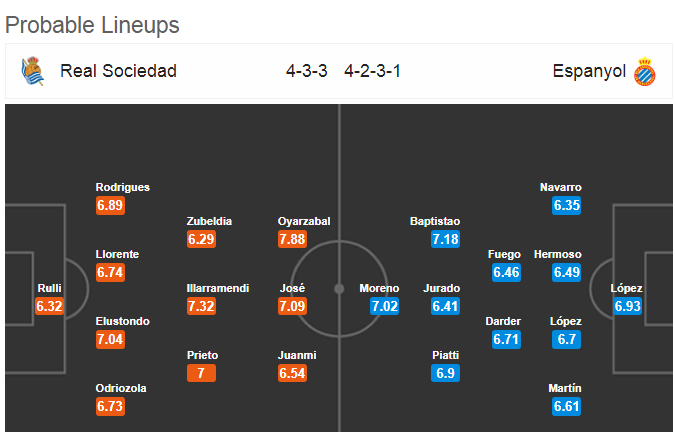 Real Sociedad have seen under 2.5 goals in 8 of their last 10 home matches against Espanyol in all competitions. Real Sociedad have conceded at least 3 goals in their last 3home matches (La Liga). Espanyol have failed to score in 5 of their last 7 matches (La Liga). Real Sociedad have scored at least 2 goals in 8 of their last 10 matches (La Liga). Real Sociedad have been scoring goals freely of late, with the only questions marks over Eusebio’s men being on the defensive side of of things. They are very leaky indeed. The hosts haven’t recorded a win in their last three home outings at Anoeta, which is a record that needs to change fast. There is plenty to like about La Real, but home form is vital to a good league campaign. Espanyol have failed to score in three of their last four matches in La Liga, with the Catalan club sure to be posed plenty of questions by a forward-thinking La Real outfit.